Well, here I am supposedly taking a short break from blogging because … well, partly because I’m a bit flat out with the other job at the moment. You know, the one that pays the bills and stuff. Important. Kind of a priority. You know, the philosophy behind the paleo diet and lifestyle got me thinking … being a bit of a history and archeology nerd … any paleo recipe true to its roots shouldn’t just be about WHAT one eats but also HOW one eats. Honestly, hunter-gatherers didn’t have a lot of time or equipment to put together elaborate 8 course dégustation menus or use complex cooking techniques. If you think of baking, it’s going to be simple stuff … because you’re going to be on the move pretty soon. No Ilve ovens and piping bags and food processors. No long list of ingredients for which you’d have to shop around. They are extremely fall-apart-fruity, which is my test of a great muffin. Very moist and much sweeter than the amount of coconut sugar would suggest. 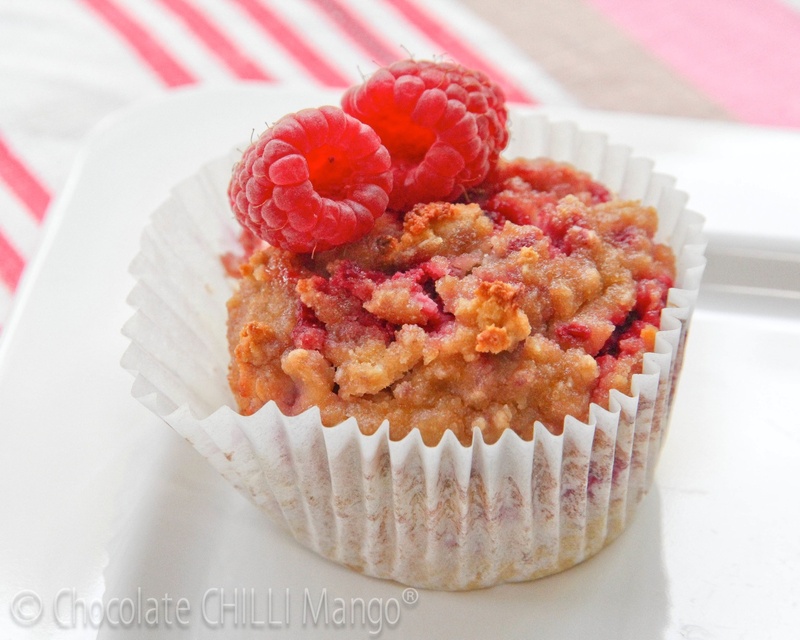 The tartness of the raspberries is amazing. 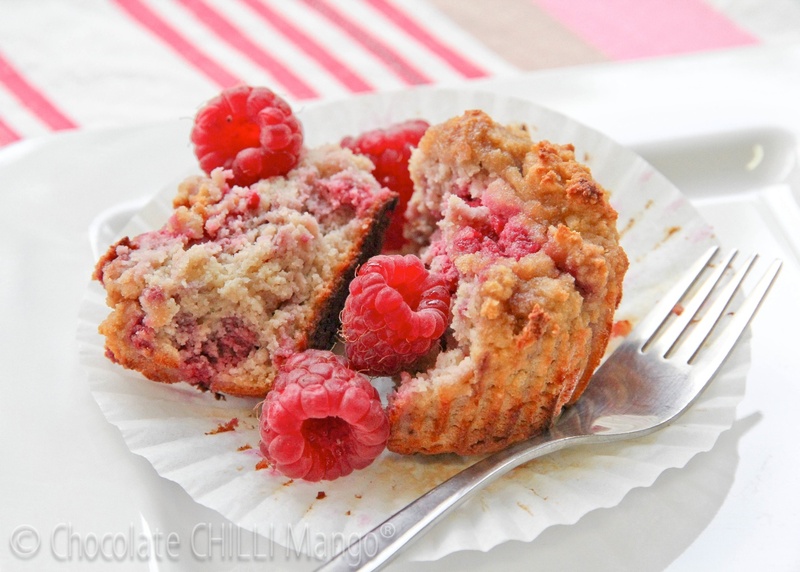 I tend to use frozen raspberries in muffins as I love to eat fresh ones as they are … seems such a waste to bake with them. This recipe works brilliantly either way. Feel free to substitute other berries or chopped stone fruits … whatever you happen to find out and about. You can always substitute fruit for the sugar, if you are trying to avoid adding any sugar or sweeteners to your food. I have provided some suggestions below. They are dairy and gluten-free by default and low fructose, which is great for anyone with a food intolerance. I hope you enjoy them. See you all soon … I’ll be back with a lovely morello cherry and caramel tart recipe very very soon. Volume measures are in metric cups. ** You can substitute coconut milk or another nut milk, as desired. Preheat the oven to 190℃. Have ready eight muffin molds, lined with muffin liners, if desired. Mix all the dry ingredients in a bowl, making sure there are no lumps. In a separate bowl, whisk together the eggs and almond milk. Use a fork to stir the wet mixture into the dry. Fold through the raspberries. If using frozen berries, there is no need to defrost them first. Divide the mixture between eight muffin molds. Bake for 30 minutes or until risen and golden. Remove and allow to cool on a wire rack. Serve warm or at room temperature. These muffins freeze well in an airtight container. To reheat, zap in a microwave for 15 – 20 seconds. I like them served with extra berries. OK sometimes I cheat totally and put a dollop of yoghurt on them. See how fall-apart fruity and moist they are? Muffins. NOT cake. I’ve provided macros for these muffins because, dang if they aren’t healthy little bundles of goodness – some protein, healthy fats, and fibre! 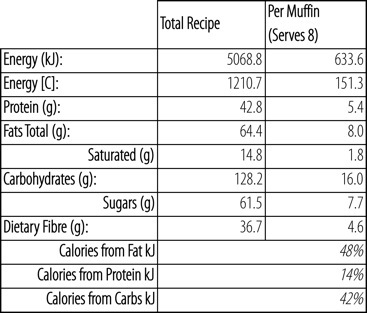 Macros are based on average values for all ingredients. I have based these on the use of coconut sugar and almond milk in the recipe. If you use another sweetener (or fruit as a replacement), and/or a different type of milk, the macros will change of course. However, it’s all good. The macros are really just indicative anyway.